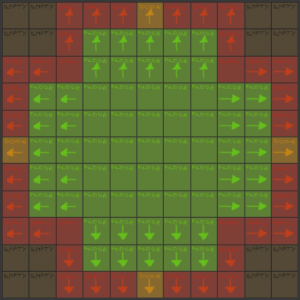 This works because I always assume that the edge tiles are empty, walls or doors and the doors are always in the middle. 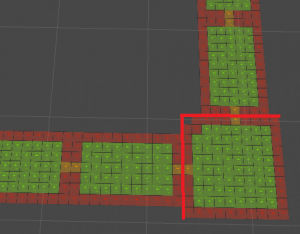 So I can just not place duplicate tiles for walls and doors — nothing should conflict. I might change this in the future, but that’s the assumption for now, which let’s me not worry about a whole slew of complications. But it’s not actually that many. 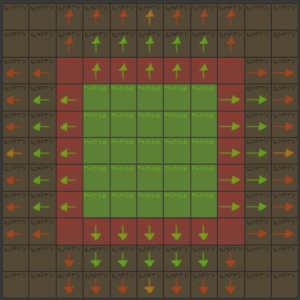 From here, I can apply rotational “symmetry”. That is RightDown room is the same as UpRight room rotated 90*. Nothing in the dungeon really cares about being in a certain orientation (and if it does, I can make the room non-rotatable and add the remaining orientation). In any case, that’s a bit easier than having 7 more room assets (RD, DL, LU, RL, RDL, DLU, LUR, LOL). I currently only have exactly 1 variation for everything. 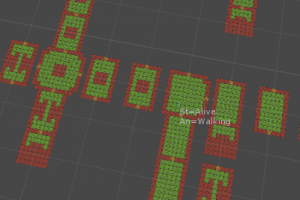 But when themes are introduced, the levels would use different (but potentially overlapping) collections of rooms. 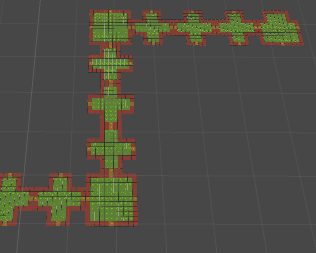 Now all that’s left is to have the dungeon generator actually decided what directions it needs, find a matching room, and rotate it before placed. 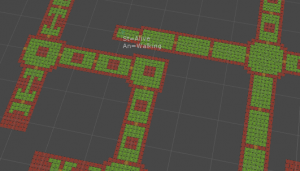 And there we go, an approach that let’s me customize rooms differently based on their neighboring connections without a complicated editor. Perhaps I could have avoided changing my approach and redoing some of the work. Perhaps a better initial design would have led me to the right answer sooner. But I think my framework is more stable after surviving the several iterations. And the direction/rotation approach is more robust than hand-specifying finicky room details and potentially getting it wrong. 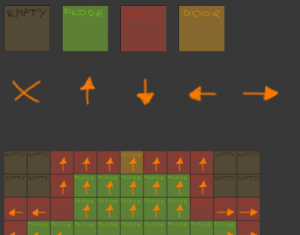 I’ve spent longer on this than I wanted, but at the same time, rooms are a core feature that I don’t want to get wrong.